Posted April 24, 2016 by Doc & filed under Articles. 1. SCIENCE BASED on fishes and their world and the “why” (as we understand it) of fish behavior. a. What Fish See, Understanding the optics and color shifts for designing lures and flies. b. 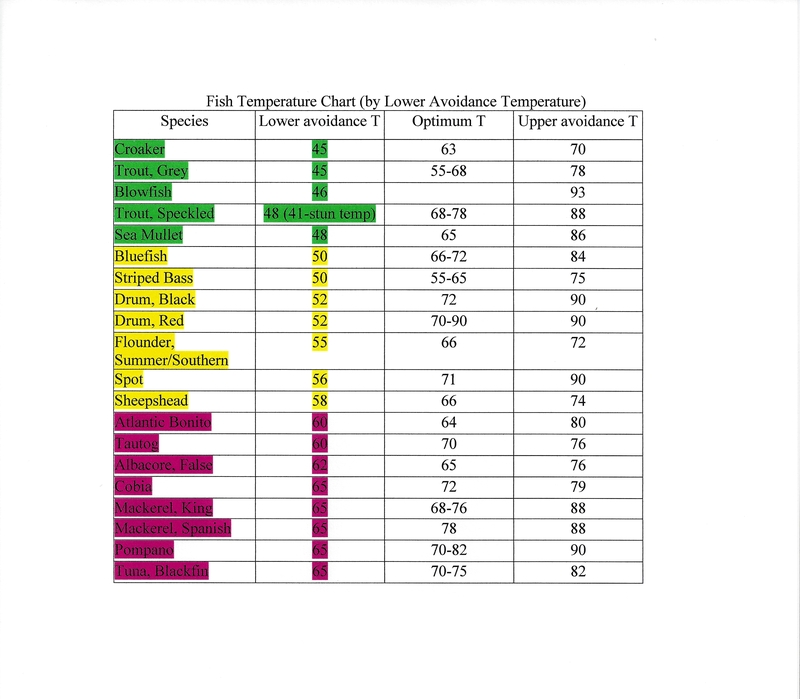 Through the Fish’s Eye, An anglers guide to fish behavior. c. The Fisherman’s Ocean, How marine science can help you find and catch more fish. a. 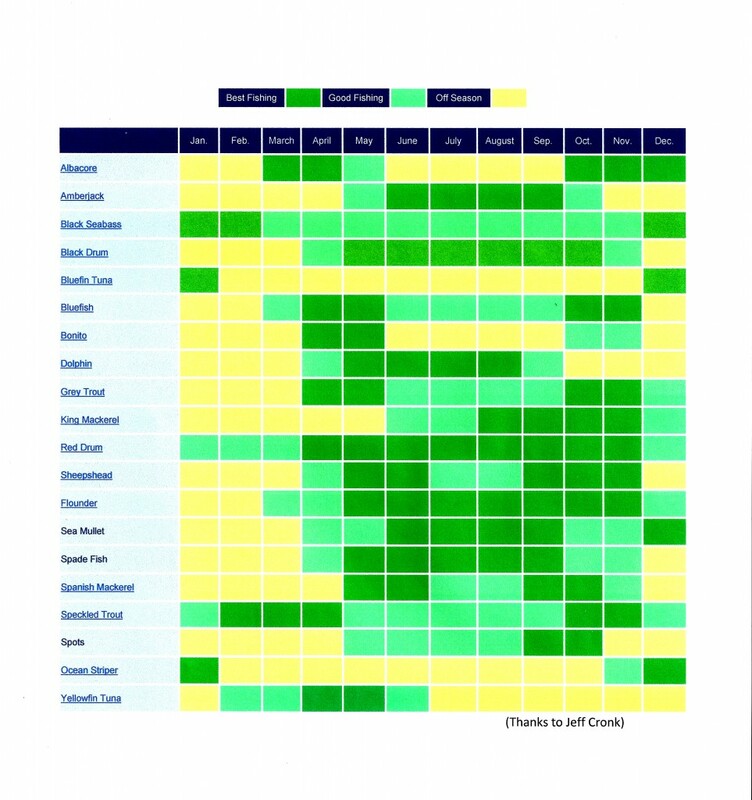 North Carolina’s Ocean Fishing Piers, from Kitty Hawk to Sunset Beach. b. Striped Bass Chronicles, The saga of America’s great Game fish. ii. Surf Fishing, Catching fish from the beach, when, where and how. b. All Fishermen are Liars, True tails from the dry dock bar. Posted April 13, 2016 by Doc & filed under Articles. The 90-ft. drop area is located about 34 miles SE of Beaufort Inlet between the 14-Buoy (WR 14) and the Big Rock. It is a 3-tier drop where the bottom drops from 90ft to 180 ft in the space of a few miles. Warm water eddies from the gulf stream are directed into this area after being deflected from the Big Rock and because of this, plus the underwater ledges, this can be a productive fishing area at times for all sorts of game fish. This area is marked on most charts of the area and Loran numbers are 27007.2/39572.4 and GPS numbers are 34 12.65/76 15.27. Other offshore locations out of Beaufort Inlet: Certainly, the West Rock is approx. 22 miles out of Beaufort Inlet on a heading 180 degrees at loran 27072.1/39521.5 and GPS 34 17.86/76 35.06. This is in the general area of the 240 rock, 210 rock, and AR 305. The West Rock is listed on all of the charts for the area and is really productive for kings, dolphin later in the summer, and bottom fishing year round. It has been the experience that the West Rock sees less traffic than some of the surrounding reefs which is fine since this reef is as productive as any in the area and you don’t have to a lot of boat traffic. Other inshore locations out of Beaufort Inlet: Dead Tree Hole (34 39.24/76 38.06), 1.5 miles South of Shackleford Banks, 3-mi. East of Beaufort Inlet. Barge, North of the Trawler Buoy off of Cape Lookout. Dump Site Buoy, just West of the old sea buoy at Beaufort Inlet. This is marked with a yellow marker. AR 315, 320 etc. Check the NC-DMF site for info on location and structure of these AR’s. (http://www.ncdmf.net ) AR 315 is great for deep jigging for Spanish and grays and live minnows for flounder. Out of Bogue Inlet 45 min. Rock, Keypost Rocks, AR 340, 342, 345 are productive. Keypost Rocks KP1: 34 38.18/77 01.90, KP2 34 37.75/77 01.76. SE Bottoms: Head S/E out of Bogue Inlet for 10 miles and you will be on SEB, they extend out another 2 miles. GPS-34 30.357/76 59.972. It is just over from Charley “C”, buoy. A- Buoy N 34 36.348 W 077 05.508 46 ft.
B- Buoy N 34 35.467 W 077 01.590 49 ft.
C- Buoy N 34 30.056 W 077 02.086 60 ft.
D- Buoy N 34 25.538 W 077 05.737 70 ft.
E- Buoy N 34 22.601 W 077 10.951 68 ft.
F- Buoy N 34 21.930 W 077 17.515 60 ft.
G- Buoy N 34 23.656 W 077 23.645 51 ft.
H- Buoy N 34 27.938 W 077 21.164 44 ft.
Posted April 3, 2016 by Doc & filed under Articles. Surf at Bogue Pier ranged from high of 54-degrees to a low of 44-degrees with an average of 49.9-degrees (blue diamonds). Bogue Sound had a high of 60-degrees and a low of 35-degrees with an average of 49.6-degrees (red squares). 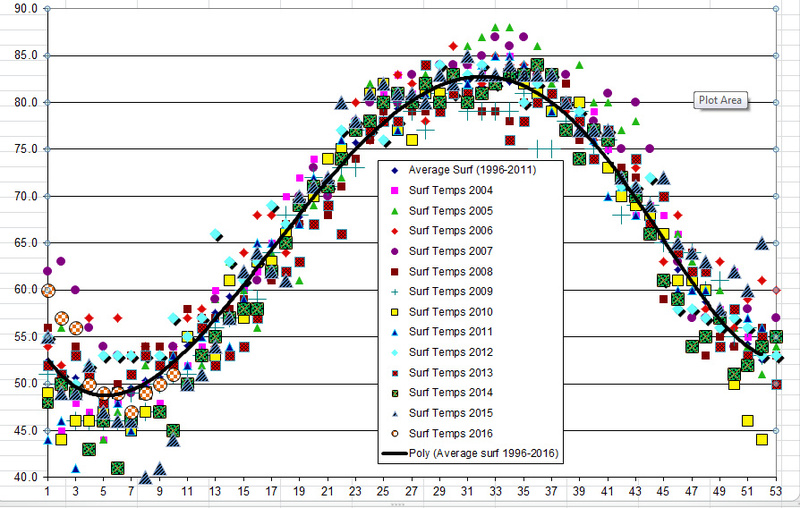 Last Feb. average for the surf was 45.3, sound 42.0. Much more moderate this year. To Braid or not to Braid, that is the Q? What are super-braid fishing lines? Remember the original braided fishing line? Dacron polyester by DuPont. Fireline, PowerPro, Tuf Line, Sufix etc. Not for casual user, took me 2-years to get comfortable with use and knots. Extra strength and abrasion resistance Easier to pull fish away from pilings etc. Original instant messaging (IM) system! Disadvantages (why not?) WIND KNOTS are a MYTH…OPERATOR ERROR! Soft, limp and thin: wind loops/knotting, wrapping of guides, hard to untangle knots and backlashes and snarls (hard to “pick” out tangle). Some are coated or fused. Will cut through mono lines of neighboring anglers and your fingers too! Use gentler hook-set, gentle sweep or wrist snap, don’t try to set hook and land fish in one motion!! Raise rod tip to tighten line and remove loops. If loop gets caught under line, pull line through roller do not open the bail and pull off of the top!!! Don’t cast to get rid of the loop or it will make a mess. If you still get a know (you didn’t do what I said), but rub some ChapStick on the knot and it will be easier to get out. 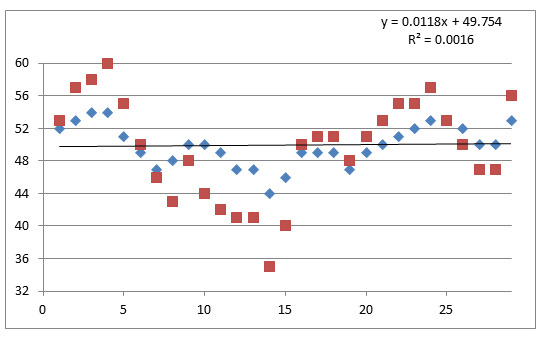 Plot is a 6-order polynomial through the data. By Dr. Bogus and many thanks to Capt. Lee Manning. To demystify this lore of the sea, I consulted Capt. Lee Manning; a former schoolteacher turned charter captain over 30 years ago. Capt. Manning currently operates the Nancy Lee Fishing Center in Swansboro and his experience not only holds the key to finding fish, but a long resident of the area, he has absorbed much of the local lore of the rocks and reefs as well. “Farther out is the South East Bottoms, but it is the same thing,” said Manning, “it’s generally the first set of rocks to the southeast after you leave 45-Minute Rock.” When asked about the area, Manning responded, “Southeast Bottoms is a big area, a real big area with a lot of rocks, just to the east, southeast of Charlie (“C”) Buoy.” When asked about the fishing the bottoms, Manning smiled and said, “In the summertime you have all kinds of fish there. You have sailfish, dolphin (mahi), there’s even been wahoo caught out there. There is some of everything caught out in that area. It’s really a super good area and a super good king mackerel area too.” And it’s less than ten-miles out of Bogue Inlet, just set a southeasterly course. 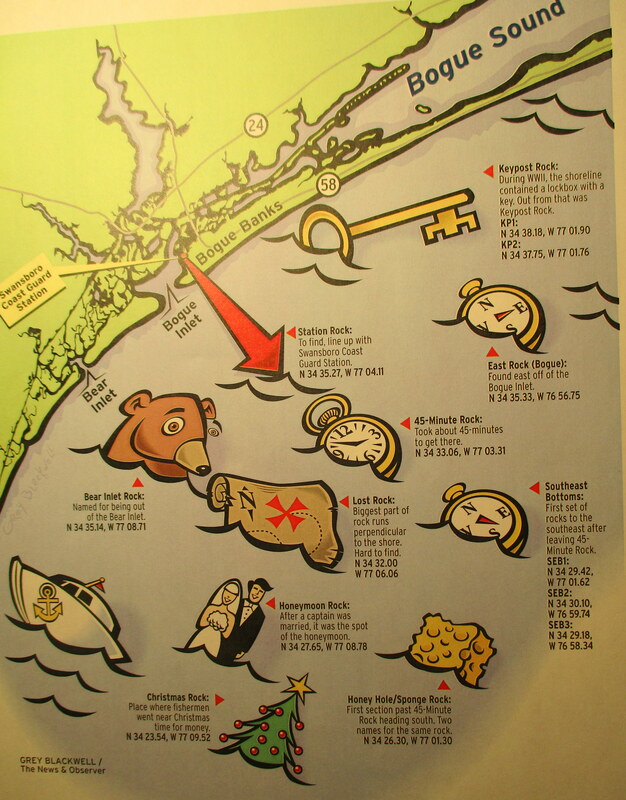 As we can see, some of the rocks are named by direction, location, landmarks and even tongue and cheek after “notable” fisherman, others from use. That includes Christmas Rock, but it may not be what you might think. “Christmas Rock, “ said Manning, “you have to go back years ago. The boys out of Sneads Ferry, when it would start getting to Christmastime, they needed money for Christmas, they went out with their fish pots and catch some sea bass and sell them. There caught lots of sea bass out there, and they always called it Christmas Rock.” And now it’s on the charts and we all know it as Christmas Rock. There are not only rocks out there that hold and sustain our local fishery, but the marked and maintained artificial reefs and the to numerous wrecks too. However, Manning mainly sticks to fishing the rocks. Why? Manning was emphatic and noted that, “I very seldom fish the wrecks unless I’m trolling because so many people know where the wrecks are and they troll on them. Usually the wrecks hold barracuda and so you catch lots of half-a-fish! “Mainly the divers like to go there and recreational folks go there,” he said. “There are so other many placers that I can go, but if I’m going by there I’ll troll across it,” said Manning. National security, the sounds of freedom Camp Lejeune, the Marines, and the “alphabet buoys”, what do they all have in common? The so-called alphabet buoys in Onslow Bay off the shores of Camp Lejeune run along an arc sector roughly from outside of Bogue Inlet to New River Inlet on a radius of approximately 12-miles. They provide a demarcation danger zone that subtends the military restricted area between Bear and Brown’s Inlets. Specifically they designate the Camp Lejeune firing range, an area that is restricted when live firing exercises are conducted or when the military requires access to that part of the ocean for carrying out maneuvers. Locally, we refer to the firing range maneuvers as the “sounds of freedom”, which has taken on even more significance since the tragedy of “9-11”. But then the question is what does all this have to do with fishing? So basically we got ourselves attractors, and a food chain is established, in fact a stable food chain for each of the buoys “A, B, C, D, E, F, G and H” and an abundance of bait fishes. If you motor over the Charley Buoy for example and turn on your sounder, what you’ll often see is massive balls of bait, sometimes on the surface often somewhere there and the bottom, which for Charlie Buoy is around 60-feet give or take a few lumps and bumps. But seeing all those potential bait doesn’t make it your bait, it’s the Sabiki or bait catcher rigs that make them bait, a string of maybe six or so tiny gold, laser sharp hooks that are jigged up and down just looking for bait to bite! Typical gear for using the Sabiki rig is simple, as Brafford pointed out, “I use real light line spinning tackle, said Brafford, “that is eight to ten-pound test (line) so if I have to break it off I can do it without ruining a whole bunch and I have a heavy egg sinker on the bottom which I paint them black.” Why I asked? “Otherwise they get eaten off,” snickered Brafford. A natural looking bait is one key to successful live baiting, which includes trolling speed. So how slow do you go? “Just a very slow troll, just as slow as I can go,” said Brafford. So the next time you hear the sounds of freedom booming in the distance, think of Camp Lejeune and our Marines first and then how lucky we are to go fish by the letters of the alphabet buoys. Recite and hum after me: A-B-C-D-E-F-G, H…, you know the children’s alphabet song! Specific information about the rules of Navigation in these restricted areas can be gotten from “Coast Pilot 4, Chapter 2, Navigation Regulations” (http://chartmaker.ncd.noaa.gov/nsd/coastpilot4.htm) and warnings of impending military use of the area will be contained in the weekly “Notice to Mariners-District 5” (http://www.navcen.uscg.gov/lnm/d5/). Alphabet Buoys: GPS Coordinates and Water Depths. 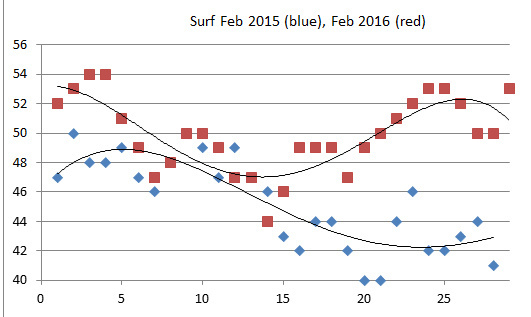 Below is the comparison of surf temperatures for 2015 (blue) and 2016 (red). 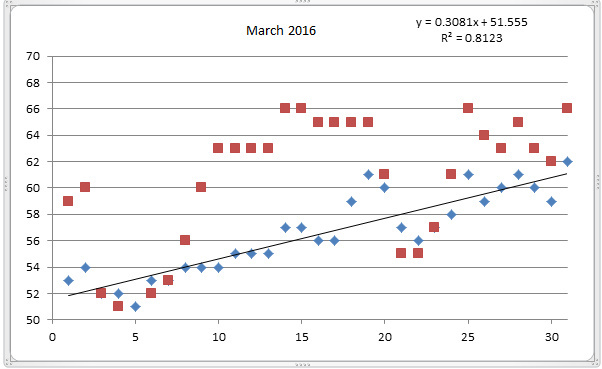 Plots are 4th order polynomial fits to the data.